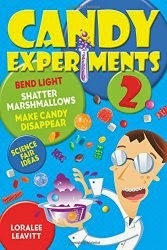 Doing so many candy experiments has led me to ask questions about the chemistry of tooth decay. I've learned that sugar contributes to tooth decay as long as it's on the teeth, but so can raisins, crackers, or anything else that the tooth-inhabiting bacteria digest and turn into acid. When I got my teeth cleaned last week, the dental hygenist had a new fact for me. Eating single jelly bean can cause as much tooth decay as eating a pound of sugar--as long as it's on your teeth the same amount of time. So remember to brush!